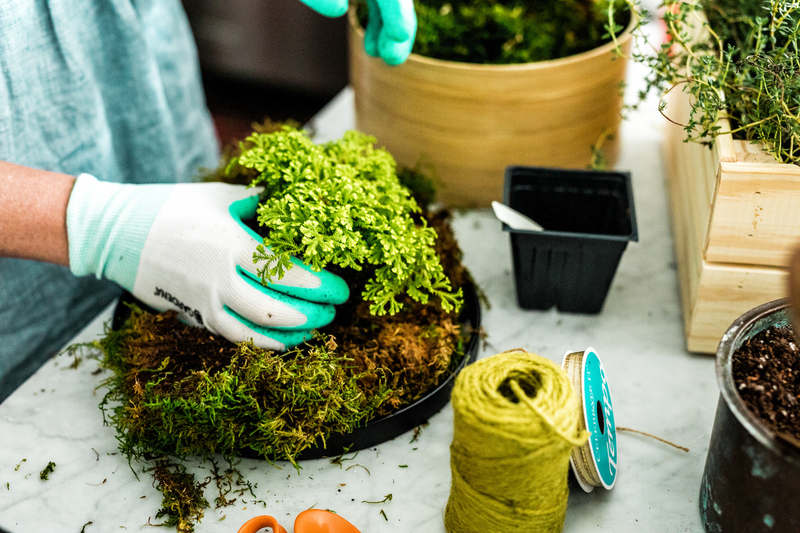 Prepare your workstation, wearing gloves to protect your hands from dye in the moss. Soak a sheet of moss (shown in container at far left) in a container of water until it is damp. Lay a piece of sheet moss on your workstation, dirt-side up. Place plant in the center of the sheet moss. Divide soil sphere in half and pack around the plant’s root ball. 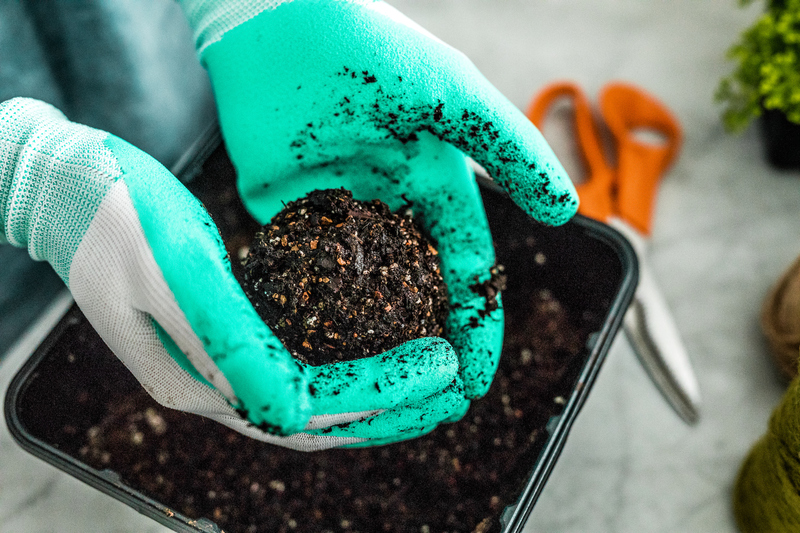 Wrap moss around the soil sphere. Use twine to tie the moss in place. 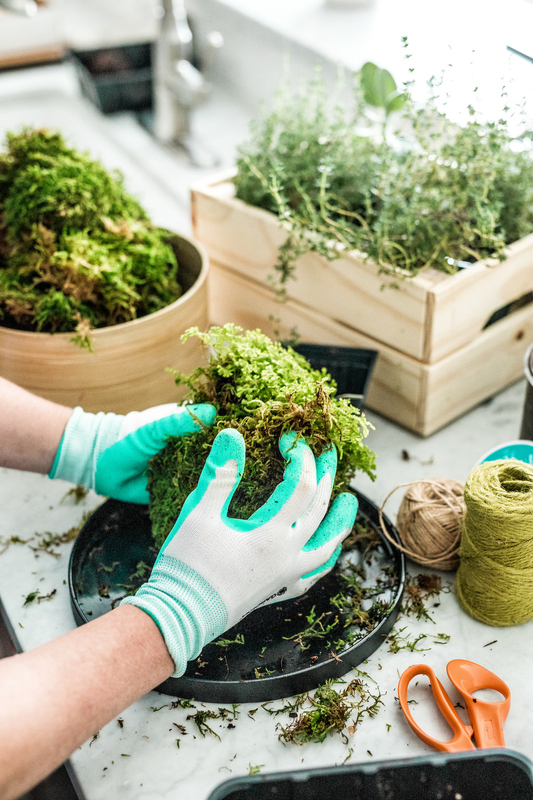 Once the moss is held securely by twine, add an extra layer of twine or decorative ribbon that can be used for hanging. 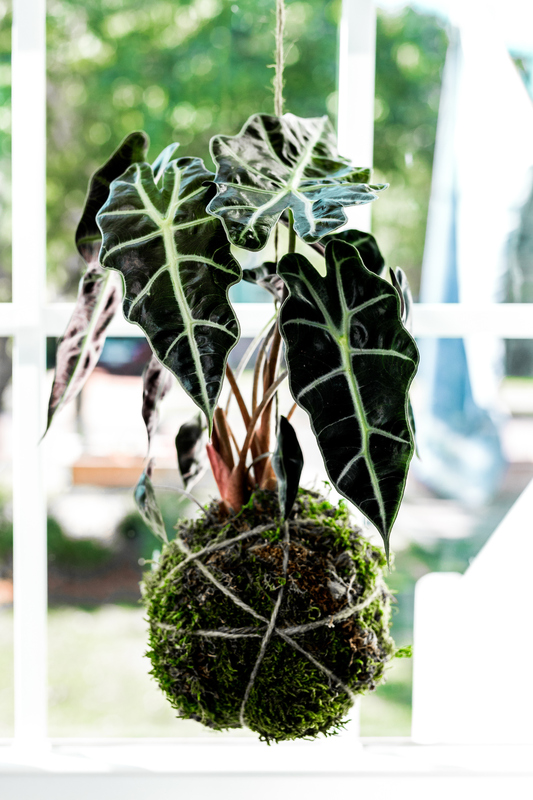 Hang Alocasia Amazonica near a window, but know that it won’t do well in direct sunlight. Also experiment with resting your kokedama inside a shallow container. 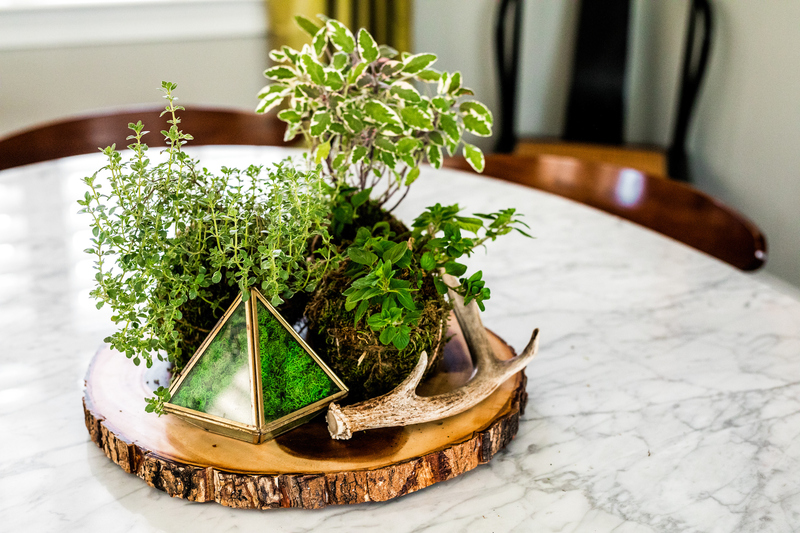 Grow kitchen herbs in moss balls, and use them to create a table centerpiece. Ivy is an easy indoor grower. African violets like bright, indirect light. Suspended from sheer gold ribbon, 'Persian Queen' geranium, 'Moon Valley' friendship plant, and 'Aurea' spikemoss work well together in this string garden. 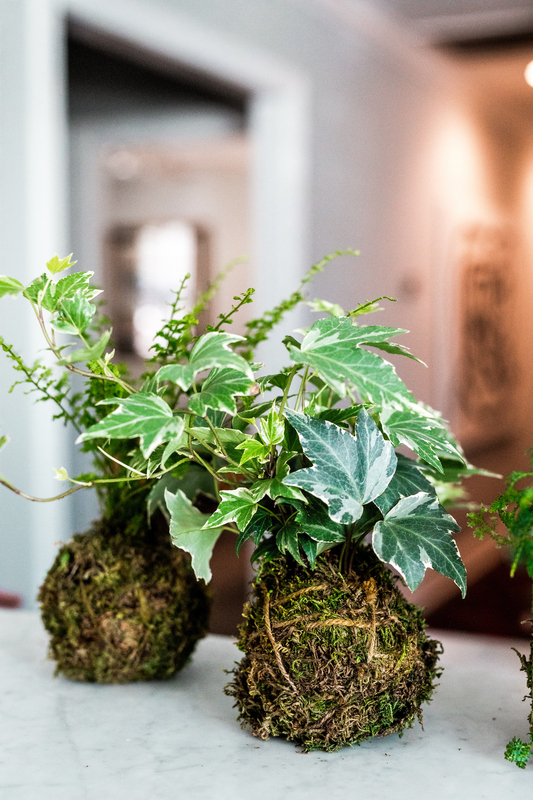 If you count yourself a garden or design nerd, you probably know kokedama: the ancient Japanese art of growing plants in spheres of soil wrapped with moss. 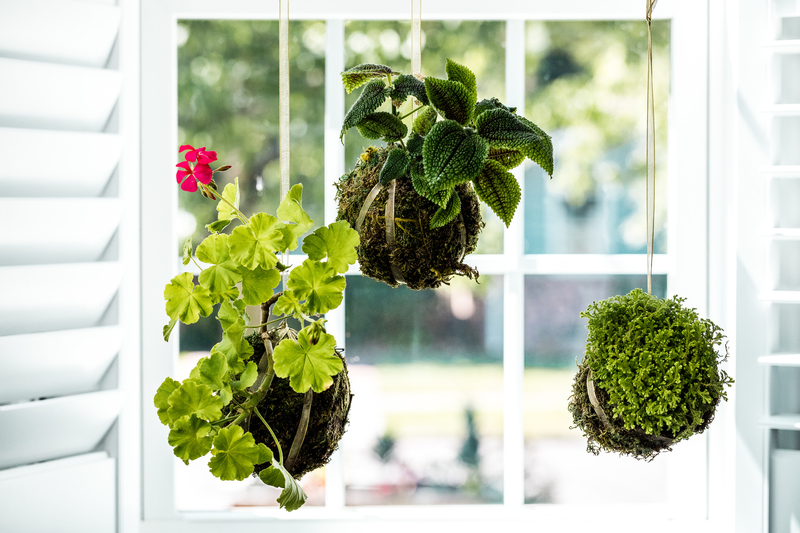 But have you tried putting your own spin on the trend, creating a kokedama to nestle into a cool container or suspending a trio to make an indoor “string garden”? It’s easy! Start by selecting where you’d like to place your growing globes, then look for plants that will enjoy the light conditions there. Geranium, ‘Moon Valley’ friendship plant, and ‘Aurea’ spikemoss (shown above) will do well in dappled sunlight. Ferns will thrive in shadier spots. 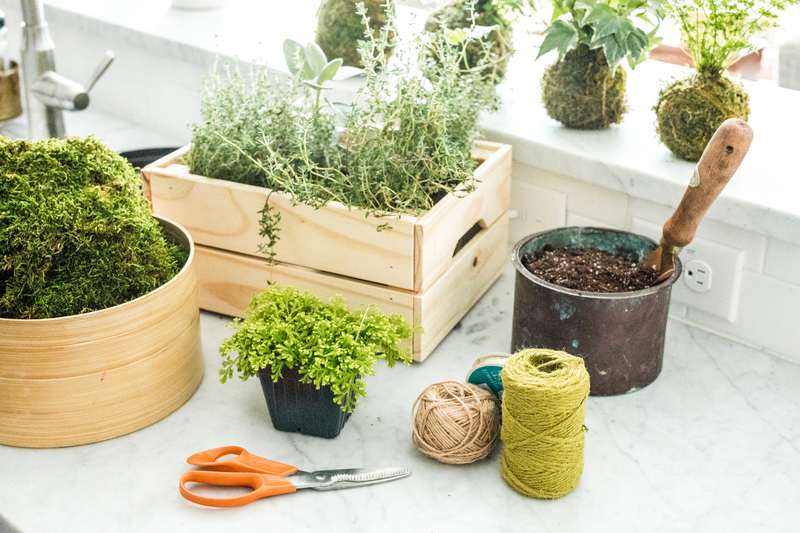 When combining kokedama into a string garden, pick plants with a variety of growth habits—from upright to trailing—and house them in balls of varying size (find step-by-step instructions at right). As for maintenance? 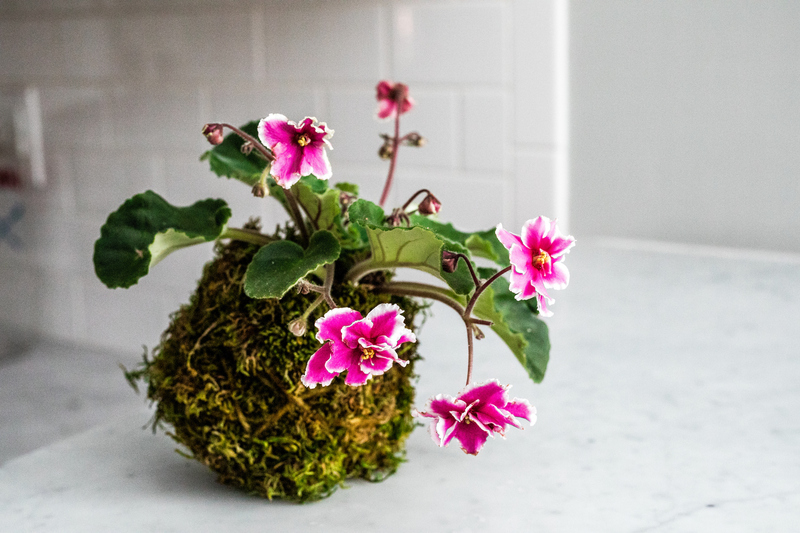 When the kokedama feels light, soak it in a container of water until it’s heavy again, and fertilize during the growing season. 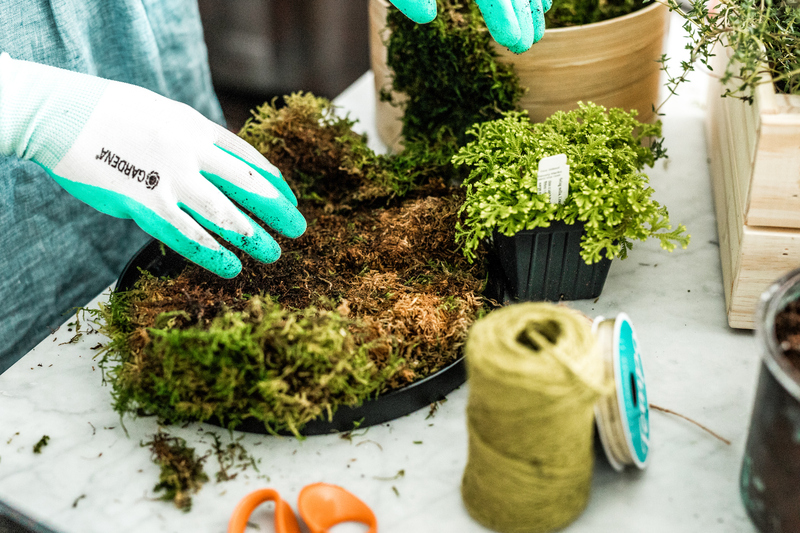 Place the plant at the center of a piece of sheet moss; then pack soil around it and use twine to tie the moss in place. 1. 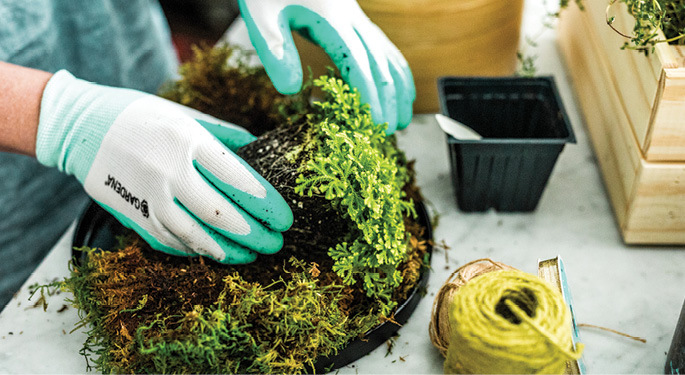 Prepare your workstation, wearing gloves to protect your hands from dye in the moss. 2. 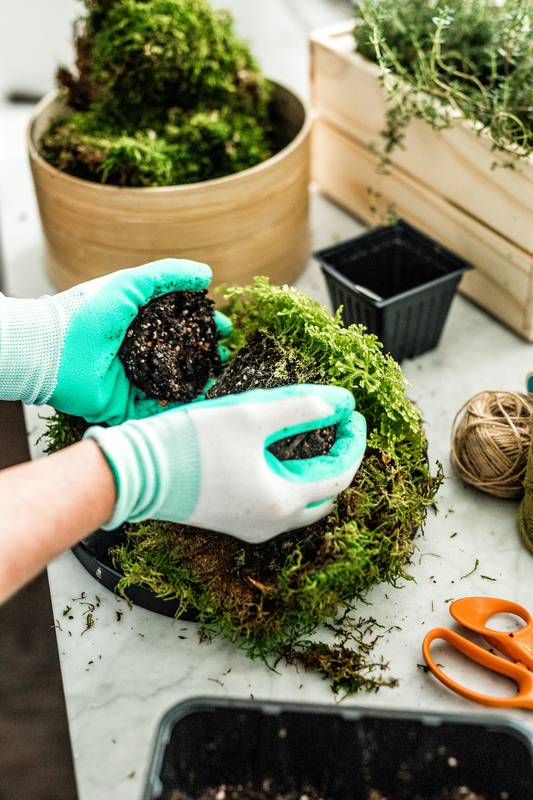 Soak a sheet of moss in a container of water until it is damp. 4. Lay a piece of sheet moss on your workstation, dirt-side up. Place plant in the center. 5. Divide soil sphere in half and pack around the plant’s root ball. 6. 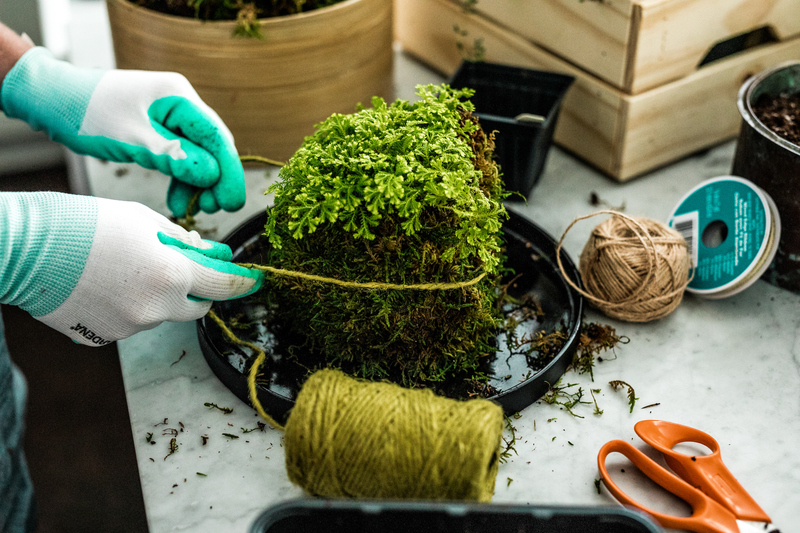 Wrap moss around the soil sphere and use twine to tie it in place. 7. Once the moss is held securely by twine, add an extra layer of twine or decorative ribbon that can be used for hanging. ■ Plants: Look for those in approximately four-inch pots. 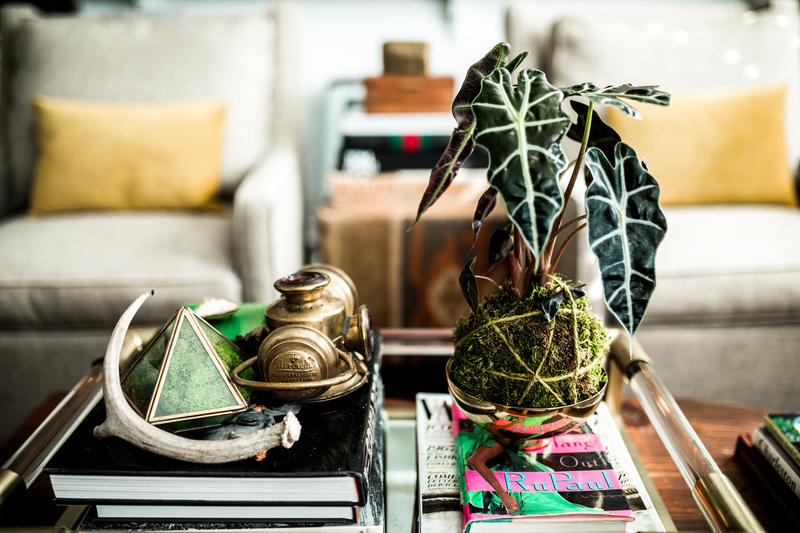 Traditional indoor plants such as ferns, African violets, ivy, and even herbs, are good choices.